The Archer & Armstrong saga first reared its head in 1992, created by Barry Windsor-Smith, Jim Shooter and Bob Layton for Valiant Comics. The millennium crossing double act gradually became acclaimed as one of the greatest superhero alliances. Re-imagined in 2012, Archer and Armstrong were temporally relocated in the ancient Sumerian city of Ur. The story begins with the origin of Armstrong – about 7,000 years in the past. Three Sumerian brothers discovered an ancient and powerful device, known as “the Boon”. In unwisely stealing the artefact the brothers triggered the device unwittingly unleashing the mysterious power contained within. Thereafter, one of the three brothers, Aram, became an immortal being doomed to exist wandering earth for all time, Aram thus changed his identity to that of Armstrong. He gained the acquaintance of Archer through a rather unexpected sequence of events. Obadiah Archer was raised by a shadowy cult isolated from the world (called “The Sect” they served as recurring season bad guys). He was trained from birth to be an assassin and warrior. Initially charged by his brethren with killing Armstrong once and for all, instead they become partners in battling evil. In the new series The Adventures of Archer & Armstrong Vol. 1, Archer must rescue his immortal companion from the clutches of the evil Bacchus and Armstrong’s bottomless satchel. The salvation of his partner will prove no simple task, with hordes of goblins and other monsters standing in their way. The initiated who appreciate artist David Lafuente (Spider-Man, Batman Ultimate) and writer Rafer Roberts (4001 A.D., Plastic Farm) will be excited about the collaboration in the new series. 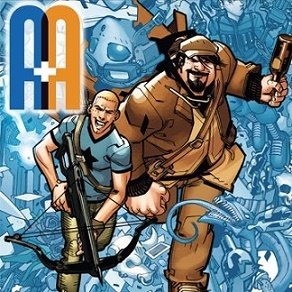 A&A: The Adventures of Archer & Armstrong Vol. 1 will be published on August 17th.